We awoke early this morning to a perfectly bright sunny day and quickly showered and got ready. Today was going to be a big day for us as we planned to ride to Shikoku along the magnificent Shimanami Kaido! Originally we had planned to ride along the Kibi plain instead but the same person who brought us the glorious cheese cake recommended that we consider riding the Shimanami Kaido instead. Although it sounded fantastic I thought that at 70km it would be too much to do in one day. We decided to go for it though as there were a number of ferry terminals, bike terminals and bus stops which meant we could call it quits if we got too tired or it got too late. I'm so glad we did as it turned out to be one of the major highlights of the entire trip! If you made me say what my favourite activity on this trip was I'd probably answer "The Shimanami Kaido! We decided to have breakfast at the hotel in order to save time and also because it was quite reasonably priced (800 yen) and looked pretty good. We were actually asked if we wanted breakfast when we checked in the day before. As we were not sure at the time if we wanted to or not I asked if we could just show up and the lady said that we could, so that's what we did. It was quite fancy inside and even had tables where you could sit down on tatami mats to eat. As we were trying to be quick we just sat at one of the normal high tables. The breakfast was buffet style and had a wide selection of pure Japanese food as well as Japanised western food. The normal Japanese food was the best so I mostly ate that. There was salmon, rice, pastries, miso soup (self made so could exclude the negi) and Udon, among other things. There's two types of sandwiches you can get at Japanese convenience stores; in the cold section you can find the normal ones that should be eaten straight away, but there's also a room temperature section where you can get a large variety of sandwiches that don't have to be kept cold. They're a little unusual as the sandwiches do not have any crust and the bread completely encases the filling making it a bit like a pizza pocket. As they don't have to be kept cold they're very useful if you want to take them along with you. On the back it does explains that if you keep them somewhere particularly hot they won't keep as long though. There's a whole heap of different types of fillings, many of which you'd expect to only be in the cold section such as egg, pizza, jam, custard, ham & cheese, ham, chocolate and peanut butter. No vegemite though unfortunately. For fluids Kate bought some water while I bought 500ml bottles of the disgustingly named Pocari sweat which is an ion supply sports type drink. This beverage is everywhere in Japan and when I first saw it my brain refused to believe that there was a product called "XYZ Sweat" so I thought it was "Pocari sweet". Nope, turns out it is sweat and the name is based on the idea that it'll replace the ions you lose while sweating. Since sweat is in English, Japanese people don't immediately think or know exactly what it means. It'd be like something here called shish sueur. English is seen as trendy in Japan in much the same way French is in English. The drink is actually quite nice, and as it has a lower amount of kJ's compared to other soft drinks, I found myself drinking it a fair bit. With our provisions all sorted out we headed to Okayama Station. The Shimanami Kaido (しまなみ海道 = Shimanami + Sea + Road) is a 60km long expressway that traverses the Seto Inland Sea and connects Onomichi in Honshu with Imabari in Shikoku. The route passes over six smaller islands which are connected to each other and the main islands by a number of impressive suspension bridges. While there are two other road connections to Shikoku, the Shimanami Kaido is special as it's possible to either cycle or walk across thanks to a specifically built bikeway. The bikeway utilises the bridges but follows a different route on the islands which adds an extra 10km to the distance and brings the total length up to 70km. As we wanted to have as time as possible on the Shimanami Kaido we decided to start in Onomichi which we could easily get to at around the time the bike rental shops opened. If we tried to start at the other end in Imabari we would probably not arrive until at least 10am. In Onomichi there are two main train stations; Shin-Onomichi Station and Onomichi station. The bike rental shop is located next to Onomichi station and while Shin-Onomichi is the shinkansen station it is poorly connected to Onomichi station. The best way to get to Onomichi station when travelling from the north on the shinkansen is to get off early at Fukuyama station and change to the JR Sanyo line, so this is what we did. We didn't bother reserving a seat as we only spent about 15 minutes on the shinkansen and after another 20 minutes on the Sanyo line, we arrived in Onomichi at about 8am. Once we arrived we set about to look for the bicycle rental place. We had a little trouble finding it at first but managed to track it down in a multilevel car park west of the green hill hotel, next to the water. You can click here for a google map to the Onomichi rental bike terminal location. The rental terminal was staffed by one man who presided over the 50 or so bikes that were available. When we arrived he was occupied with hiring a bike to some other people but told us to pick a bike each. As there were many different bikes available (no two were the same) we had a bit of trouble deciding which one to pick. We both picked bikes with 21 gears and a basket although Kate got the women version and I got a men's. Similar to Moerenuma Park I had to fill out a form before we could hire the bikes. I'm not sure if the bike hire man spoke any English as we used Japanese. He explained that while it cost 1500 yen to hire the bike, 1000 yen was refundable if we managed to return our bikes to the same location. He also showed us how to lock the bikes and asked if we were going to ride the full way. Since Kate was a novice bike rider and had only ridden a few times in her life before, we didn't think we'd be able to do the whole journey in one day. So instead I said that our plan was to get a ferry to Setoda from which we'd ride the rest of the way. Upon hearing this the man went to look up the ferry times and said that we were lucky as there was one leaving in the next 10 minutes! I had no idea how often there's a ferry to Setoda but judging by his reaction- not often. I asked where the ferry terminal was and he explained that it was just around the corner, behind the hotel. Before we left we were also given an English map that had a heap of very useful information marked including distances, an elevation profile, rest stops, towns, attractions as well as the recommended route. Also marked were alternate intermediate and advanced routes. The advanced route looked quite challenging and appeared to scale some of the mountains where there were helpful messages on the map such as "Don't give up!". Once we arrived at the ferry area a man asked us where we were going. When I said that we wanted to go to Setoda he said that was his boat and pointed to where we could buy a ticket. Inside a building there were some ticket vending machines from which we got one way tickets to Setoda port which cost 800 yen each. Once we had our tickets we walked our bikes across a gangway to a floating boat platform. The boat had yet to arrive and while we were waiting the man explained that it cost an extra 150 yen to take our bikes which was to be paid aboard the ferry. He also told/gestured that the boat staff would load and unload our bikes. He only spoke Japanese and I was a bit worried I was missing something as he seemed to labour the point a little with some enthusiastic acting. Nothing expected happened though so I guess he was just making sure we understood. We lined our bikes up as we were told which were joined with a lady's scooter and someone else with a push bike. One the boat arrived we left our bikes and hopped aboard. Our destination, Setoda, is a small port town located on Ikuchi island which is the third island in the chain that the Shimanami Kaido traverses. The ferry was quite small and I'd estimate it to seat around 30 people. There was a morning show playing on a TV which lost signal every 5 seconds making the set-up seem a little pointless. Soon after we boarded someone came around to check our tickets and who we gave the extra 300 yen for our bikes. Setoda was the final stop of about five others along the way and it took 40 minutes to get there from Onomichi. The sea was a little rough at times but nothing too bad. When we arrived there were a few people waiting to get on the boat which was returning to Onomichi. One of these people was an old lady who very persistently tried to force a big bag of free mandarins on us. We didn't want them and I tried to polity refuse, she was really insistent and kept putting them my bicycle basket while I was saying things like "Iya iya iya, Omoi kara" and giving them back to get. Eventually she gave up on us and found another victim (who was also refusing). After that encounter we had another couple came up to us and the wife said in Japanese "Where are you going? My husband speaks English". She also said that she was waiting for friends so had some free time to help us. I said that we were going to go to the Kosanji Temple before riding along the Shimanami Kaido. I'm not sure how much English her husband actually spoke as he didn't really use any and after looking at our map for a while, he just pointed us in the direction the we needed to go. Although as the temple is up on a hill we could actually see it from the ferry terminal anyway. I spoke to the lady for a bit and she asked some of the usual questions. She asked where I learnt Japanese and when I said "University" I think she assumed a Japanese university because when I said we were staying at Okayama she asked if I was staying at a University there! When I said no she asked if we were doing a homestay and I clarified that we were staying in a hotel. Maybe she thought we were there for a longer time period than just a short holiday? While it was nice talking to them we were a bit anxious to get going as it was already about 9am and we still had to see the temple and ride all the way to Imabari before 5pm in order to return our bikes. Luckily their friends arrived after a few minutes and we managed to escape! We rode the short distance to the temple and put our bikes in the bike rack located out the front. Kate had a fancy wheel lock that was built into the bike and used a key. Mine was a simple chain lock with a four digit combination which was written on a piece of plastic I could take with me. Kosanji Temple (耕三寺 = Till + Three + Temple) was built quite recently in 1936 by a businessman in honour of his mother, and belongs to the Jodo-Shinshu Sect of Japanese Buddhism. The complex is quite elaborate and features a cave, a hill of marble and many buildings modelled after famous Japanese temple buildings. The temple is quite expensive to visit at 1200 yen and after I told Kate the price she said she'd just wait outside. Thankfully I managed to talk her into it and drag her up the steps to the entrance. After buying our tickets we were given booklet with five blank spaces in it. It was for a 'Stamp Rally' and the lady showed us a map where the different stamps where located and said we'd receive a present if we managed to collect all five. The temple smelt quite strongly of peaches for some reason although we didn't actually see any around. As it was built into a hill the complex was terraced into four main sections which were connected with stairs. We started by looking at a few of the different buildings on the western side of the first level (which included a bell tower and a few gates) before proceeding up some stairs to an impressive five storied pagoda and two other big buildings. We had so far collected our first two stamps and at this point found the entrance to the cave. The cave started in the side of a hill and led down underneath the temple. It was quite elaborate at 350m long and took about fifteen minutes to walk all the way though. The first section had some quite gruesome artwork and statues that depicted the Buddhist version of hell with demons squashing, cutting and otherwise mutilating people. The path then twisted around a fair bit and had a number of spiral staircases as well as bridges leading over the water that was flowing through the cave. At some points this water tickled down as a little waterfall and the sides of the path were lined with hundreds and hundreds of Budda statues. After about a quarter of an hour wandering through the dim cave, we finally emerged into the dazzling sunlight further up the hill on the third level. Near where we came out there was a giant 15 meter tall statue of Kannon, the goddess of mercy. We had a look around the surrounding area which included an octagon hall, a tea house as well as a nice little Japanese garden. Further away from the statue on the same level there were some more halls, a temple gate, as well as the main temple building. From here we went up to the final level which is the location of 未来心の丘 (Not yet + Become + Spirit + 's + Hill) which is translated by the temple as "The Heights of Eternal Hope for the Future". This area does not have any religious purpose and was built from imported Italian marble purely for artistic reasons. We got our third stamp near an elevator that provided access to this top part of the temple. The amount of marble on the hill was incredible! Since it was a such a nice sunny day the marble was very white and bright and looked really expensive. We walked along a marble path that led to the pinnacle of the hill which provided excellent views of the surrounding town, mountains, islands and the sparkling Seto sea! This area was absolutely covered in marble and there were some stairs leading up to the apex where the "Tower of the light" statue stood. There were also a number of other abstract statues around as well as a Cafe built out of marble- which was closed while we there. Probably because it was still relatively early in the morning. Once we were sufficiently dazzled we went back down all the stairs and had a look at a few buildings we'd missed on the eastern side of the first level and found the penultimate stamp. While we were collecting our stamp a man came rushing over to us from somewhere and asked if we wanted tea! We said sorry and that we were just there for the stamp! To get the final stamp we had to exit the temple and visit a building across the road which turned out to be a museum housing Buddhist art. There was no one else in there apart from a lady who offered us a choice of one of two post cards as a prize after we collected the last stamp. Since we were there we felt obliged to have a look around. While it was a quite a big building there was not a huge amount of art on display and we gave it a quick lap before exiting and returning back to our bikes. By this time it was already about 10:30am and time for some serious riding! The whole length of the Shimanami Kaido is marked with an incredibly helpful blue line that follows the recommended route. After locating the line in Setoda we were led through the town and out along the sea. When we first found it though, we were not sure what direction to follow it in! We decided that going left was probably the right choice and were quickly reassured as the lines had distances to the towns written at periodic intervals. The town names were written in Japanese; counting down from 52km was our destination of 今治 ( Now + reign/fix = Imabari) on Shikoku while the other way was 尾道 (Tail + Road Way = Onomichi) on Honshu. At first we rode along the road on the left hand side and saw where that lady in Setoda had got all of those mandarins! There were heaps of them growing on trees in plantations right next to the road. The mandarins were really orange and tasty looking- I wanted to nab one as we rode past! We actually felt a little unsafe riding along side the road next to the traffic so we crossed to the other (seaward) side where there was a separated bicycle/pedestrian path. It was fantastic fun riding along the ocean and the scenery was spectacular! It was also quite exiting due to the state of the ocean. We were riding pretty close to the water and the tide looked to be pretty high. Apart from that, the sea was memorising to look at as it was absolutely boiling. The waves didn't seem to be breaking or travelling in any particular direction, but were surging up and down by about a meter. This was not high enough to breach the wall in most cases but every so often the waves would constructively interfere with each other and crash up against and over the wall. They'd even make it all the way over the bike path and onto the road. I took a few videos in an attempt to capture one of these huge splashes in action but only managed to wet my camera! All this activity was cause by the wind which was blowing an absolute gale. The wind was incredibly strong and the strongest I had ever experienced. It was cyclonic. Like when you see those news reporters on TV during a typhoon. After riding along the sea for a while we saw our first bridge appear in the distance! This is the Tatara Bridge which, despite its appearance, is not actually a suspension bridge but is instead a cable-stayed bridge. In fact, it is the second longest cable-stayed bridge in the world and connects IkuchiJima (生口島 = Life + Mouth + Island) with our next island, ŌmiShima (大三島 = Big + three + Island). When we got closer to the bridge the blue line we were following led us off to a dedicated bicycle road which curved up to the height of the bridge. So far we had ridden 5.7km and were therefore about 10% of the way through! Since the path up to the bridge was built with cyclists in mind the gradient was not too hash and did not even require standing up on the pedals to get up. It was also sheltered from the wind so we were able to get a bit of a break from the onslaught. There were quite a few blind corners though and it was important to keep left in case someone came flying down the hill on the other side. We saw a sign warning about feral boars but unfortunately didn't actually see any! The words underneath the cute picture of a pig didn't refer to boars directly and just said "動物注意" (Doubutsu Chuui) which means "Cation: Animals". The bridge was really impressive looking and I was excited that we were going to ride across it! Near the top the path split into two with bicycles (自転車 = Self + Turn + Vehicle = Jitensha) directed off to the left and scooters/motorcycles over a certain c.c class led off to the right. Before entering the bridge we went past a box where we paid a small toll to cross. It was free for pedestrians but cost us ¥100 each. The car road we had been riding along thus far was just a normal road as the bikeway diverges away from the expressway on the island. This was good as the actual expressway had a fair amount of traffic on it travelling at high speed. Thankfully on the bridge the bikeways were separated from the road with a solid fence, so we didn't feel threatened by the traffic. Both directions of pedestrian and push bike traffic were handled by the left (north) side of the bridge with the powered bikes that were diverted earlier travelling on the other side. You know how I said the wind was strong down at the ocean? Absolutely nothing. A slight breeze. The wind on the bridge was the most intense wind I had ever experienced by a huge margin. It was very loud and at some points created an ear piercing whistle through gaps in the bridge structure. I found it exciting although Kate did not like it at all. Once we reached the other side of the bridge we broke away from the roadway and rode along a little bridge that led to a path that curved around a nearby hill and descended back down to sea level. It was a lot of fun riding back down the hill! The wind also disappeared once we were off the bridge which was a relief. This island was not nearly as windy as the previous one either. Once we reached the bottom of the hill we turned left at a sharp 90 degree turn, rode a long a little further before crossing a road, which we then rode along on a separated path on the left side. The bridge itself was 1.4km long but if you include the on and off ramps it was 4.2km and therefore we had so far ridden a total distance of just under 10km. The section along Omishima was not quite as close to the ocean as Ikujima, but was still pretty close with the water about 50m away. The area was quite rural and we passed by some more mandarin trees. I loved how, despite the rural location, there were vending machines every now and then along the side of the road. After about six kilometres the road we were riding along became a dead end and another dedicated bike path led off to the right for our climb up to the next bridge. This path weaved its way up a hill before joining the Omishima Bridge which, at about 40m high, is about equal as the lowest elevation bridge along the route (excluding the short one from Onomichi as you should get a ferry rather than cross there). About half way up the hill we stopped for a little snack along the side of the path. We each had a Kit Kat, some nuts and a drink. We then continued up the path to the bridge. This Omishima Bridge is not a suspension bridge either and is instead an arch style bridge (2-Hinged Solid-Rib Arch). It's also the shortest bridge along the route at 297m in length or 1.2km for the bike way if on ramps and off ramps are included. The bridge cost ¥50 to cross and had quite a large section dedicated to pedestrians and cyclists. The views of the surrounding mountainous islands and ocean were amazing. Along the side there were some information plaques in Japanese. As with the other bridges the wind was strong but not nearly as bad on this one as the other three. On the way down the other side of the bridge we saw a sign for a bicycle rest stop and since it was just about lunch time we decided to stop there and have lunch. Before reaching the rest stop a group of fully Lycra clad, super biked, streamlined helmeted cyclists passed us. I'm not sure who ought to be embarrassed, us for being under prepared or them for being over. It was possible they were doing the intermediate or advanced route though. The rest house had a vending machine and a porta loo out the front and some seats, a guest book and a microwave inside. It was quite a small little building, you could probably only squeeze about 10 people in there, and we were the only ones there at the time. At the Conbini I saw this man and his dog! We sat on the seats inside for a little while and ate our lunch. It was a Lawsons and I got two big Kit Kat crunchies, one for now and one for later. Kate bought some 'low fat' ice cream. It was only "Low fat" compared to one of the other ice creams there (Häagen-Dazs) that apparently had "A bajillion kJ's in a tiny little tub.". While I was waiting outside and eating my chocolate a sudden gust of wind blew over a bunch of other people's bike that were lined up near me! They went down like dominoes! I had to quickly stand them all back up before anyone came out lest they think I knocked them all over. After our three breaks over as many kilometres it was time to get back to some serious riding! We quickly covered the remaining distance of Hakatajima (伯方島 = Chief + Direction + Island), which at 1.9km, was the shortest island stretch of the Shimanami Kaido, before reaching the Hakata Oshima Bridge which was our third bridge and first true suspension bridge. Well, at least half of it is a true suspension bridge. The first part connects Hakatajima with the tiny island of Michikajima (見近島 = See + Close + Island) and is a steel box girder bridge with a length of 325m. The remaining 840m connects Michikajima with Oshima and is a stiffened box girder suspension bridge with two hinges and a single central span of 560m. This bridge cost 50円 to cross and was mind bogglingly windy. Including the on and off ramps the distance along this bridge was 3km. As with the other bridges the views were amazing although the wind was starting to even bother me a little. Kate absolutely hated the wind and bridges at this point, although I managed reassure her a little by pointing that as this last island was our longest stretch yet at 11.4km, we wouldn't have to face another assault for a while yet. At the end of the bridge the expressway dove into a tunnel and the bike path peeled off and looped back under the bridge. We followed the coast for about 2 kilometres before making a right turn inland and riding through the town of Miyakubo which was the most populous place we had encountered since Setoda. Once the town thinned out we climbed our first hill that that was not associated with a bridge and the highest hill we'd ridden up so far. Once we reached the top we whizzed back down, rode through a rural area and another small population centre before climbing yet another hill. The reason we were going over hills is because we were travelling through the middle of the island. On the other islands we just travelled around the outside edge and therefore remained more or less at sea level. Towards the top of the hill way Kate saw a huge centipede on the path! I went back to have a look but it was unfortunately gone by the time I got there. The second hill was not as high as the first but once we reached the top we could see our final and most challenging bridge in the distance, the Kurushima-Kaikyo Bridge. At the bottom of the hill right at the start of the bridge there is a little town where we stopped for a while. On the way into town we had see signs about a rest area and while we found a place we were not 100% sure if it was the rest area. There were some toilets which we used and a vending machine where I bought another bottle of Pocari sweat. I also ate my second Kit Kat so I'd have enough chocolate energy to make it over. Nearby, there was a restaurant/cafe with some seats although we didn't go over there. I also think there might also have been a bicycle terminal in the vicinity as well. Once we were as ready as possible we got back on our bikes and began riding up the path that took us up to the bridge. The Kurushima-Kaikyo Bridge, at just over 4km long, is the longest suspension bridge structure in the world. There are a total of six towers and four shared anchorages that make up the three bridges of the structure. All three bridges are stiffened box girder suspension bridges with two hinges. The first, second and third bridges each have three, two and one spans, respectively. To get up to the bridge deck we rode along another dedicated bicycle/pedestrian path that looped around to the top. This was the most fun path we rode up as it was not built around a hill but fully exposed and let us ride around up in the air. At the top we paid the most expensive toll yet of 200円. Once we started riding across the bridge the harsh wind slammed into us. This bridge was the highest and the wind felt the strongest yet. It had already passed the point of being unbelievably strong so I'm not sure how to describe it. It wasn't strong enough to actually pick us up but that outcome didn't feel like it was far-fetched at all. It felt like there was some sort of invisible material covering you and pulling you backwards. It would have been fantastic if the wind was coming from behind us but unfortunately it was coming from our front right. This had the effect of not only rolling us backwards but also threatened to blow us over off our bikes. As with the other bridges the wind was blowing through the metal and creating an ear piercing whistling noise. These noises were emanating from certain points along the bridge and would remain in the background until we approached wherein they'd build to a crescendo before dying back off again. One final challenge was that unlike the other bridges this bridge actually had an incline to it so for about 3 quarters of the way we were actually riding up hill as well. I found the bridge to be very impressive and the experience pretty exciting. The views of the ocean, the islands and the bridge structure itself were amazing. Just the length of the bridge itself was pretty impressive. Poor Kate though was not having much fun and was nearly taken out by the bridge. She said later that she thought that she was going to die. The cause of death would be "excessive wind" I guess. At a few points she had to push the bike as the wind was too strong and was blowing her and the bike over. Although at the beginning of the trip I was a fan of the wind, I had definitely changed my allegiance by this time as well. There was a strange sort of pain associated with it- especially in the eyes. I thought we were at the end at one point as there was a curved path leading down to land. It turned out to only be one of the little islands the bridge used for support and we still had a while to go. The going got much easier once we reached the apex of the bridge's hill and started riding back down. We eventually reached the end of the bridge where we wizzed down and around another looped path and were finally free of the wind . The length of bike way including off and on ramps along this bridge was 6.4km which bought our total ride distance so far up to 39.8km. We were now officially in Shikoku! This meant that we'd now managed to visit three of Japan's four main islands, leaving only Kyushu to go! After following the bike path under the bridge we came to a sign that indicated that the Sunrise Itoyama was located a short distance down another road. This is the main bicycle terminal of the Shimanami Kaido and we rode over to see if we'd leave our bikes there or continue to Imabari, which is another 12km away. As the next bus to Imabari didn't arrive for another 40 minutes we decided to continue riding all the way to Imabari station where the last bicycle terminal was located. Happily the blue line marking the Shimanami Kaido continued and we were able to follow it all the way to the station. Soon after leaving Sunrise Itoyama we rode past a man who was directing traffic due to construction- and he started clapping and said "グッドジョブ " (Guddo Jobu) or "Good Job" as we passed! The blue line followed a fairly major road for a little while and we almost lost it when it suddenly made a right turn at an intersection. Luckily though, Kate spotted it. We came across the railway tracks relatively soon and thought we were nearly there but it turned out that there was actually still a fair way to go. We just kept following the blue line. 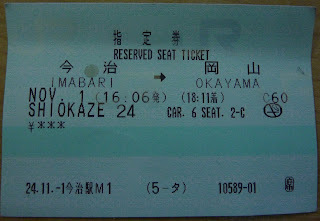 Eventually, we finally arrived at our final destination, Imabari station! It was just before 4pm when we arrived and we looked around for the bicycle terminal. We had a little trouble at first but managed to locate it on the south western side of the station. There was a man waiting there who accepted our bikes. He asked where we came from and was impressed when we said Onomichi (I didn't clarify that we skipped ahead to Setoda!). He explained that as this was a different terminal we would not get our deposit back and had me fill out a returning bike form. While I was filling out the form he laughed while patting his backside and said something like "痛いだろう" (Itai darou? ), "It hurts right? ", and indeed, our backsides were killing us! After I was finished with the form he directed us to wheel our bikes over to a gated enclosure where we left them before going into Imabari station to get our ticket. 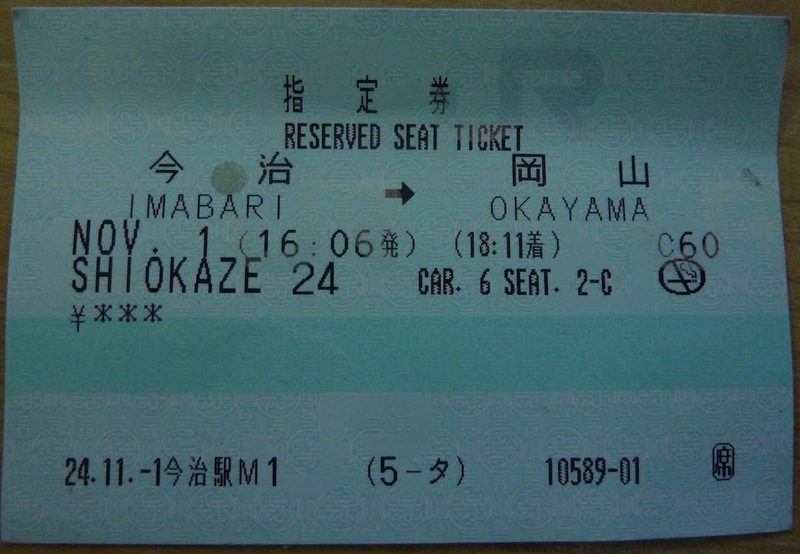 A Limited express Shiokaze (しおかぜ) train leaves from Imabari to Okayama every hour from around 2pm and takes about two hours to get there. We were lucky enough to arrive just in time for the 4:06pm train. Before we left I got a jam and cream bun thing from a bakery in the station that I ate during our train ride back to Okayama. The Shiokaze followed the coast of Shikoku for about 100km up to Utazu where we crossed over to Okayama using the Great Seto Bridge, which another connection between Shikoku and Honshu and the only one that has a railway line. Once we arrived at Okayama we had a quick dinner at a ramen shop near an underground section near the station. I think we got some sort of pork ramen. After finishing dinner we returned to rest back at the hotel as we were completely worn out! We had an absolutely awesome time today (even with the wind) and we'd both highly recommend a visit to the Shimanami Kaido to anyone staying in the Okayama/Hiroshima/Shikoku region! Tomorrow we'll be paying a visit to the third and final connection between Honshu and Shikoku at the amazing Akashi Kaikyō Bridge near Kōbe. I'm the Ehime representative for JapanTourist.jp and I read this post with great interest. This kind of first-hand info is very useful for people thinking of coming to Japan. Would you be interested in repurposing some of this content as articles on our tourism site? It would be great if you could review the places you stayed and some of the tourist sites you entered. You can sign up here if you're interested. Contributors are awarded points towards various goods and services, which might be useful for you on a future trip. I'm sure other visitors will find your highly readable and informative information invaluable, so I really hope you'll write something for us! Thank for very much for reading my post, and for the positive feedback! Honestly, I really appreciate it and I'm really happy that you think what I've written is useful! I've had a look at your site and I am very interested although I have a few questions. 1. My posts are very long (4000 - 6000 words) compared to what you're looking for (~500 words). Would the idea be to split it up into chunks and omit that which cannot be plotted on map? In this post I suppose I could have an entry for Kosanji, as well as each of the bridges and maybe the rest stops- but much of the rest might be hard to fit. Or would the idea be to pretty much rewrite mini articles about different locations? 2. If I contributed some articles would it be possible to include a hyperlink back to this blog. 3. Once I contribute do my contributions (especially the photos)then belong to you- or do I retain some rights? "Contributor grants a perpetual, non-cancellable licence to Metropolis, and to its successors and assigns, to use, copy, translate, modify or alter, prepare derivative works, display, perform (privately or publicly), publish, transmit, distribute, advertise, demonstrate or otherwise exploit the Content in whole or part, separately or together with the Contributor's trademarks in any medium (now known or hereafter devised) without limitation on a non-exclusive basis." "Metropolis agrees that Contributor retains its rights to enter into separate reproduction and exploitation agreements with other parties besides Metropolis and its related parties." Does that mean you're able to use my content as much as you like, but I am as well? 1. That's it exactly. Kosanji would make a good article for JapanTourist, as would something about the places you've stayed. Things like each bridge might be hard to produce a full article about, but we also have Photo Stories which are perhaps more suitable for bridges that have a strong visual impact. Photo Stories require from six good shots with captions and a short intro of 50 words. Articles about regions other than Ehime would be most appreciated too. 2. You're welcome to put links in both your profile and each article. 3. The copyright is shared, so you're still free to use your content as you like. What's your name by the way? If you'd like to communicate by email, my address is rod.walters@japantourist.jp. It was interesting to learn that the Shimanami Kaido was a highlight of your trip. A lot of people say similar things, although the route is still not widely known. I hope to make it more accessible to people who have little or no Japanese. The guide in English that you mention is excellent (quite unusual for English pamphlets produced in Japan! ), but guides on paper don't have much reach, unlike blogs and websites. Sounds good, thanks for taking the time to answer all my questions! I've signed up as "Eric Thompson" and I'll probably start with one or two articles later this week. I think I'll be putting most of my energy into finishing up this blog first though. Yeah I hadn't even heard of the route before until it was recommended to me by the resident expert on japan on the whirlpool.com.au forum 'A777'. The pamphlet is indeed fantastic; it looks even better than the Japanese one. It's strange how it's not available at all online as the Chinese and Korean versions are. I used the Korean (Korean language skills = 0) version when I wrote my article, though I've since discovered that Kate kept a paper copy. Some parts of Japan are getting quite good at the tourist pamphlet thing. Others are lagging behind. But most regions don't recognize the importance of making it available on the web as a first priority. When I visited Miyajima recently, I used a very useful pamphlet in Japanese for walking up the magnificent mountain there. Unfortunately the pamphlet turned into a wadded piece of cardboard due to the sweat that got to it in the pocket of my cargo trousers. When I came to write my article, I looked for it online for reference, but in vain. Thanks for the extensive post! I need to head back to japan for this ride. How difficult do you think it would be for a non-japanese speaker to travel through here? Thank you for reading and thank you very much for the comment! Yes, I'd definitely recommend this ride and it would not be difficult at all to do it without any Japanese language knowledge- the route is well marked and there's not really much language going on (pictures). Lots of people do so with no issues. For tips I'd just recommended to make sure to get the ferry across from Onomichi. This is because the main road bridge is a little hairy apparently (we got a much longer ferry to another island but there is another shorter one that goes to near the start.). Also, be aware there are (cheap) tolls for the bridges- you just throw your money in a box (they're marked). Make sure to return your bike if you hire one , most people return them to different outlets (check the outlet closing times), which means you lose your small deposit. You're also asked to choose a bike when you hire one, then you fill out a little form, the guy may also ask what your plans are (with a map). You only need sign/body language here and they probably get a couple of non Japanese speakers daily. Oh- there are a few busy periods too. Thanks for the Onomichi ferry tip! It may be a few months to a year before I can get out here, but I will definitely use this as a resource. I'm a road biker, so I would likely be one of those "Lycra clad, super biked, streamlined helmeted cyclists" zipping by on the way to the advanced routes (currently looking into transporting my bike over from the US for a larger scale bike tour). Only been to Japan once for a 13 day trip, but I love everything Japan has to offer - Will have to check out the rest of your blog entries to get some extra tips too :). PS: did you have a hand in writing portions of the pamphlet material :)? The challenging routes sounds like fun- there's lots of stuff along/near the route I'd still like to do (Bunny Island (!!) and Art Museums on Omishima) so I expect I'll be back one day. Cycling around Lake Biwa is also a popular ride I think- someone in a Japanese conversation class I went to mentioned this to me when I said I'd ridden across part of the Shimanami Kaido. Googling around there looks to be some information floating about on the web, looks like it's a two or three day ride (220km). Ahaha nope I have had nothing to do with any pamphlets in Japan or elswhere- no idea who did that! hi! may i ask what type of camera u are using to take these magnificent pictures? I took these photos with just a Panasonic Lumix TZ7 compact digital camera, which I had for the 2011, 2012 and 2013 trips. This camera actually got a chipped lens at the start of the 2013 trip, which ruined a lot of photos! For the 2014 and 2015 trips I bought a Canon EOS 600D DSLR! Planning a trip to the Shimanami Kaido and I'm finding your suggestion about catching the local train route at Fukuyama very helpful. Thanks!